Hey there!!! 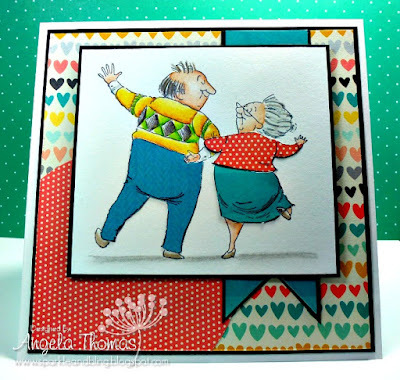 It's Friday and you all know what that means, It's Bellarific Friday over at Stamping Bella. Today's challenge was a fantastic sketch by Julee Tilman of Verve Stamps/Mojo Monday. I have flipped the sketch over on its' side so that I could use this fun image called Forever my always. I really wanted to use the sentiment but I didn't leave enough room for it. Boo me!!! The image has been colored with Prismacolor pencils and gamsol. I also did some paperpiecing of the pants, skirt and shirt. Fun!!! Next week's challenge is a 1-2-3 Challenge!! Make sure you get your card entered for Bella \Bucks (perfect time considering the new release coming up soon). The sneak peeks start in just a couple of days and boy are they ever fun!! !